With the identification of UALVP 31 as a specimen that could be confidently referred to Euoplocephalus based on the shape of the cervical half ring, I now had a pretty complete skull, and some postcranial material, to help expand our knowledge of Euoplocephalus. 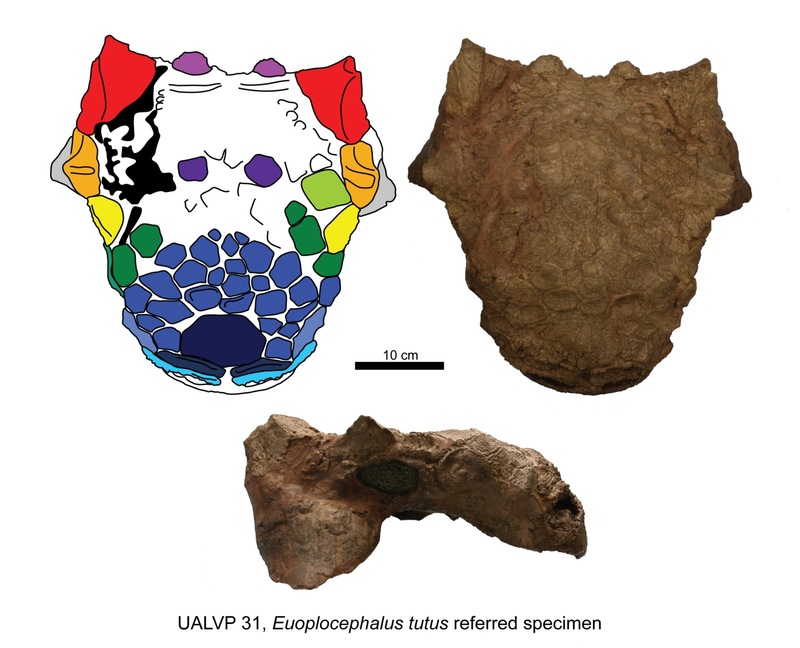 The Euoplocephalus skull UALVP 31. From Arbour and Currie (2013). The top of the skull of UALVP 31, and the holotype CMN 0210, is covered in small flat polygons. In some ankylosaurs, like Saichania and Minotaurasaurus, these polygons bulge upwards from the skull. One of the things I wanted to know was whether or not the shapes and patterns of these polygons could be taxonomically useful. 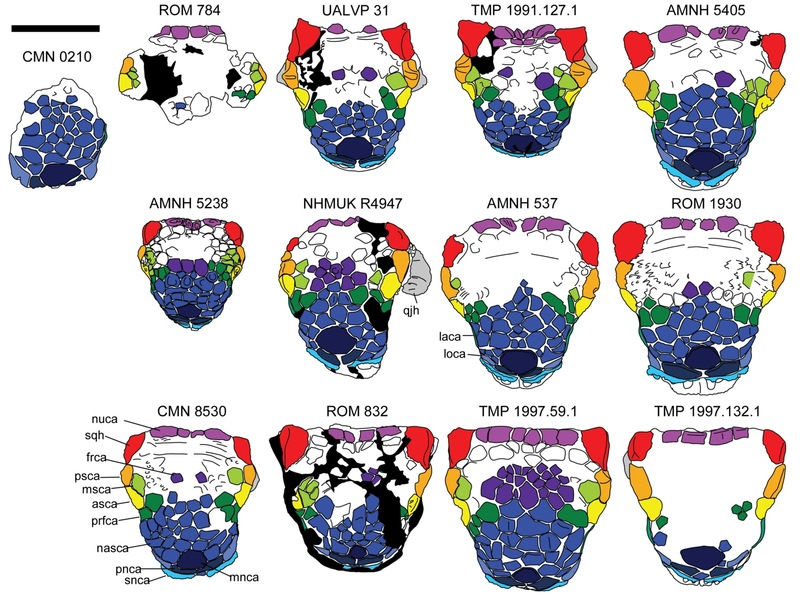 Many previous authors have said the distribution of polygons in at least some regions of the skull is random, but was it really? One problem is that there hasn’t been a consistent nomenclature for these polygons, and it’s also unclear what their developmental origin is. Are the polygons fused osteoderms, like in the skulls of gila monsters, or are they formed from sculpturing of the skull bones, like in crocodiles? Ooh, labels. The ‘ca’ in the abbreviations usually refers to caputegulum. From Arbour and Currie (2013). To get around the osteoderm-vs-sculpturing problem, I decided to use a term that was coined back in 2001 by William Blows, but which had not caught on in the literature: caputegulum. Caputegulum means ‘skull tile’, and neatly removes any developmental origin from the descriptive aspect of comparing the polygon patterns among skulls. I compared Euoplocephalus skulls to juvenile ankylosaurs which had visible cranial bone sutures, so I could figure out which bones the caputegulae probably belonged to. Some caputegulae had been given names before – like the supranarial caputegulae or the median nasal caputegulum – but others are new for this study, like the lacrimal and loreal caputegulae. By naming the caputegulae, it is easier to compare them. This is where having a large (and by that I mean ‘large’) sample size for this study was essential. If wanted to understand how the caputegulae patterns and shapes varied in Euoplocephalus, I needed to see as many specimens as possible. I tried to look at pretty much every published skull referred to Euoplocephalus, and all of the more recently collected or unpublished skulls that I could find out about. Do you have a skull in your collection that I missed? Let me know, I would love to see it! 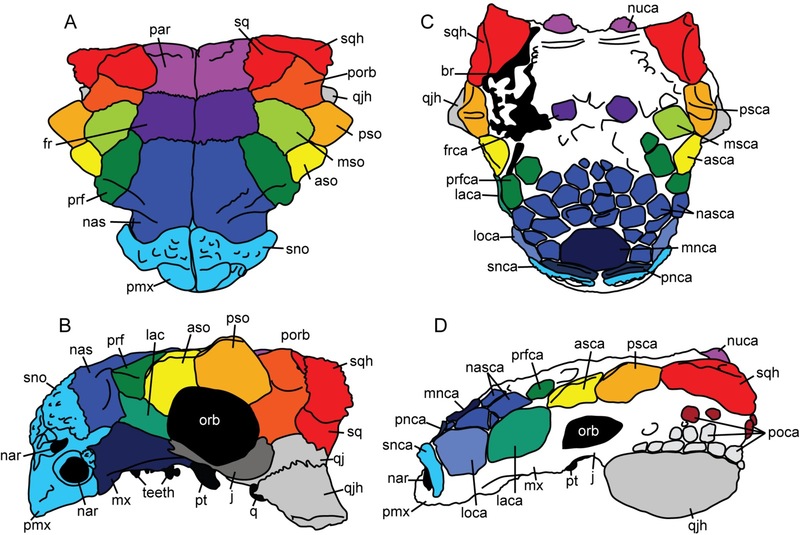 Rainbow ankylosaur skulls FTW! From Arbour and Currie (2013). When you compare the Euoplocephalus skulls, there’s definitely a lot of variation in the shapes, numbers, and positions of the caputegulae. But there is also a lot of stuff that is pretty similar, or varies only slightly. For example, all of the skulls have a large hexagonal median nasal caputegulum, all of them have a single loreal and all of them have a single lacrimal caputegulum. What are some of the sources of variation? I’m not entirely sure. The number of discrete caputegulae varies a lot, as does how far back on the skull they go before they fade out in the parietal region. Maybe this is just regular variation, or maybe it has to do with ontogenetic changes. TMP 1997.132.1, and CMN 8530. See the extra caputegulae behind the eye? From Arbour and Currie (2013). As I looked at the skulls, I noticed that some of them had extra caputegulae at the base of the squamosal and quadratojugal horns, and some of them didn’t. 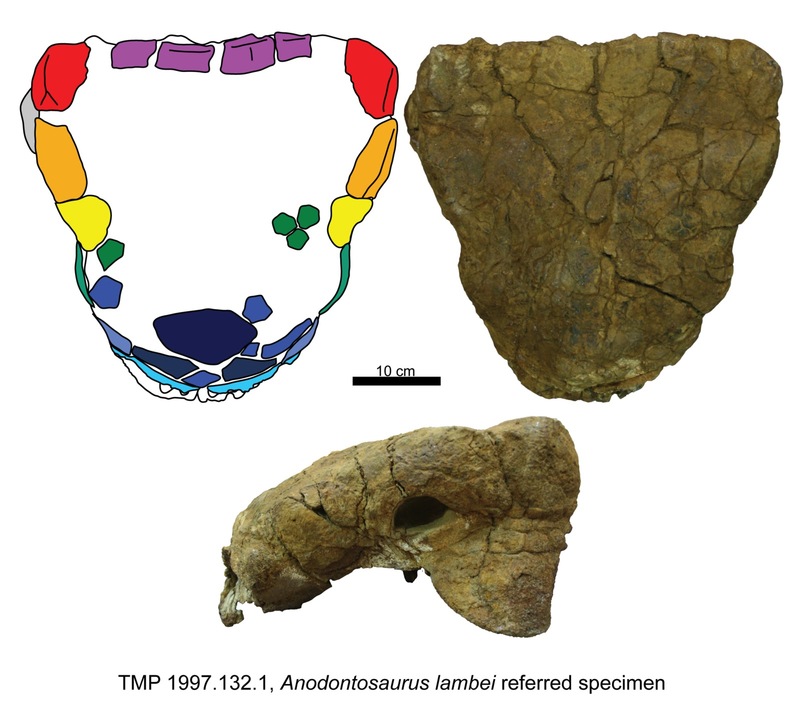 I thought this was pretty interesting, because the specimens with these extra caputegulae (which I called postocular caputegulae) always had extra, smaller osteoderms (interstitial osteoderms) on the cervical half rings, ringing the main osteoderms. What turned out to be very interesting indeed was the fact that whether or not a specimen had these extra osteoderms seemed to be related to its stratigraphic position! Specimens from the Horseshoe Canyon Formation always had postocular caputegulae and interstitial osteoderms, and almost all specimens from the Dinosaur Park Formation did not. One significant exception is TMP 1997.132.1, which is from relatively high in the Dinosaur Park Formation compared to most of the other specimens. The stratigraphic separation of cranial ornamentation features wasn’t the only difference I noticed. Tail club knobs from the Horseshoe Canyon Formation were typically wider than long, and had a pointy look to them in dorsal view, whereas the ones from the Dinosaur Park Formation were usually about as wide as long, and round in dorsal view. All together, these features seemed to indicate that “Euoplocephalus” specimens from the Horseshoe Canyon Formation were not the same species as those from the Dinosaur Park Formation. CMN 0210, the holotype of Euoplocephalus, is from the Dinosaur Park Formation. 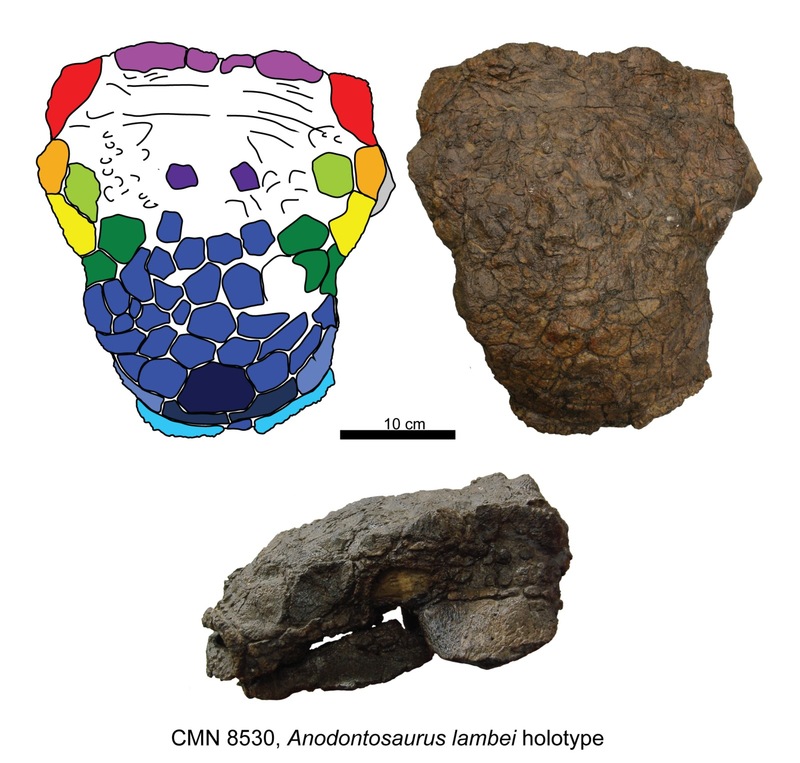 But CMN 8530, the holotype of Anodontosaurus, is from the Horseshoe Canyon Formation. And lo, the taxon that I originally thought I was least likely to resurrect became one of the best supported species in my paper. Anodontosaurus has postocular caputegulae, interstitial osteoderms on the cervical half ring, and a wide, pointy tail club. Anodontosaurus was also probably orange. So there. It’s a shame about the name – Anodontosaurus means ‘toothless lizard’, which isn’t really accurate at all. Ankylosaurs have very small teeth, but they are definitely present. The holotype of Anodontosaurus, CMN 8530, does not preserve teeth, but that doesn’t mean they weren’t there – teeth often fall out after an animal dies. Oh well! Anodontosaurus it is. Next time: a headless and clubless wonder – how will the mystery of NHMUK R5161 be solved? Arbour VM, Currie PJ. 2013. Euoplocephalus tutus and the diversity of ankylosaurid dinosaurs in the Late Cretaceous of Alberta, Canada, and Montana, USA. PLOS ONE 8:362421. Blows WT. 2001. Dermal armor of the polacanthine dinosaurs. In: Carpenter K (ed). The armored dinosaurs. Bloomington: Indiana University Press, pp. 363-385. Coombs WP, Jr. 1995. Ankylosaurian tail clubs of middle Campanian to early Maastrichtian age from western North America, with description of a tiny tail club from Alberta and discussion of tail orientation and tail club function. Canadian Journal of Earth Sciences 32:902-912. Sternberg CM. 1929. A toothless armoured dinosaur from the Upper Cretaceous of Alberta. Canada Department of Mines Geological Survey Bulleting (Geological Series) 54:28-33. 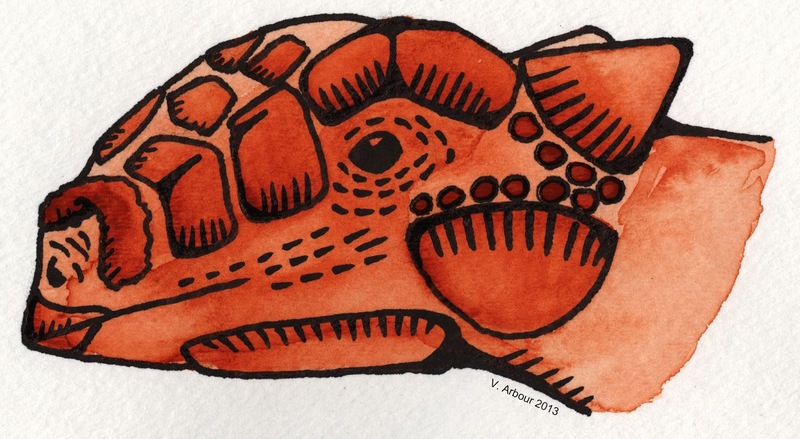 ← Who-oplocephalus: Is Euoplocephalus ‘real’? I believe the median nasal caputegulum of Euoplocephalus is larger than the corresponding element or elements in Scolosaurus. But what about thickness? Are the nasal/premaxillary caputegulae the same thickness in these taxa or is there a difference?